The blind on the right just downright broke and fell down. The string on the blind in the middle is broken and the slats don't hang straight. I had plans to sew some fancy burlap trimmed roman shades, but I never got around to it. Well, we have been a little busy with the reno at the Mountain Cottage. Mr. DIY put them up, but they really should have been about one inch wider for a perfect fit. They still were better than a missing and broken blind. Ikea to the rescue! I thought the same curtains we have in our Breakfast Room would be perfect to cover up the gaps. Mr. DIY picked up a couple pars of Vivan curtains at Ikea on the way home one day for $9.99 each. Gotta love that! He picked up a black 10ft rod at Ikea for $7.99. The curtains are about an inch too long and I might shorten them. Should I shorten them or not??? I absolutely love what you've done! The curtains really soften the windows up. I personally am not a fan of the puddle but, I think these look GREAT! That turned out great. The curtains added to the look. I don't mind some puddling but sometimes I thinkeoplw tomato far with it. At least if you decide to shorten them you can leave the hem alone and do it at the casing area. My pets would just lay on them if I left the extra fabric- lol. Well, yes, I would shorten them. Somehow the room just isn't "formal" enough for the puddling, and they seem a little cramped in there with so much material at the bottom. They might look tidier if a bit shorter. Great solution all round! 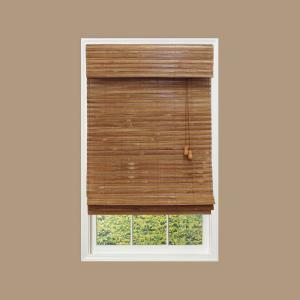 So will you still use the bamboo shades? Will they lay on top of the sheers or under? I like puddle curtains, but I think it would look better with a narrower hem. What about flipping the panels upside down, with the wider hem at the top?? I'd have to 'play' to find what I like. Your home is so beautiful, has it ever been in BH&G or Southern Living? If not, it should! I also don't care for puddling. Great DIY idea for this window! A big improvement! Window dressing can make or break a window, and the sheerness of these drapes adds a nice soft touch. Personally I'd 'lose' the bamboo one as it makes the window look over-dressed, and privacy doesn't appear to be an issue from what I can see. I'd lift the drapes until they just skim the floor, for a more free-flowing effect. Big thumbs up from Oz! Love the blinds and drapes, looks so pretty on that gorgeous window.